Parenteral is one of the most commonly used route of drug administration, oral administration being the most preferred one. A steady rise in the development and availability of parenteral drugs has resulted in the increasing demand for several advanced drug delivery devices that promise cost containment as well as ease of administration. Prefilled syringes are one of the most rapidly expanding segments of the injectable drug delivery devices market. There are several benefits of prefilled syringes over traditional delivery systems: improved safety, ease of administration, accurate dosing, and reduced risk of contamination. These advantages form the basic foundation for the success of prefilled syringes and are likely to continue driving the market during the forecast period. Technical advances in the sector, rapid growth in the biologics market, and the growing preference for self-administration using autoinjectors, prefilled syringes, and pen injectors are the key factors boosting the global market for prefilled syringes. The global sales of prefilled syringes amounted to US$3.5 bn in 2015 and is projected to reach US$7.9 bn, expanding at a CAGR of 9.3% over the period of 2016 to 2024. Prefilled syringes are available in two key types – plastic (polymer) and glass – depending on the kind of material used to develop the barrel of the syringe. Despite the fact that the industry has been reporting a growing use of polymers by many manufacturers of syringes, glass is still considered to be the top-most choice and will continue to dominate the market in terms of volume as well as revenue. This is attributed to the fact that changing the perception of healthcare practitioners and manufacturers over the preference of glass over plastic is expected to be a rather gradual process. The segment of glass prefilled syringes is anticipated to lose market share toward the end of the forecast period, which will be replaced by plastic syringes. The latter is expected to grow at a CAGR of 10.8% from 2016 to 2024. By application, the market is segmented into vaccines, monoclonal antibodies, and others. On the basis of distribution channel, the prefilled syringes market is categorized into hospitals, ambulatory surgical centers, and mail order pharmacies. Europe has maintained its position as the leading regional market for prefilled syringes in terms of volume (unit consumption) as well as revenue. However, the APAC market for prefilled syringes is anticipated to exhibit strong growth at a CAGR of 11.3% during the forecast period. The presence of leading drug manufacturers in the region requiring prefillable syringes and the high conversion rate from vials to prefilled syringes are the primary factors likely to support the growth of the APAC market. Asia Pacific is perceived as a follower rather than a leader when it comes to the development and adoption of new technologies. 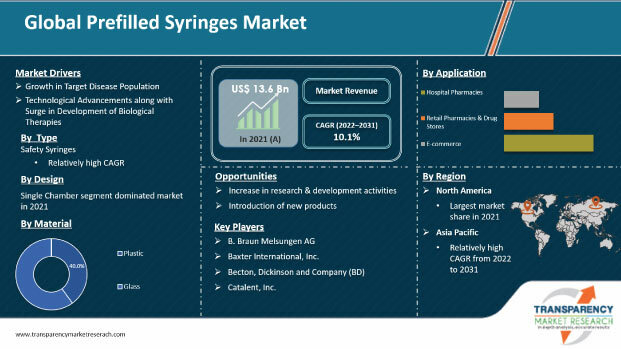 Although the prefilled syringes market is presently in its stage of infancy in APAC, factors such as improving economic conditions, the rising purchasing power of the people, the growth in awareness regarding the advantages of prefilled syringes, and the presence of a large patient suffering from various chronic diseases are expected to drive the market to register a double-digit CAGR. In Asia Pacific, Japan accounts for the major share in the market by revenue as well as volume. Major players in the global prefilled syringes market include Becton Dickinson & Co., Gerresheimer, Medtronic, Baxter International, SCHOTT AG, West Pharmaceuticals, Vetter International, Unilife Corporation, Stevanato Group, and Terumo Corporation. This report provides a forecast and analysis of the prefilled syringes market on the global and regional levels. It provides historical data of 2015 along with forecast from 2016 to 2024 in terms of revenue (US$ Mn) and volume (Bn Units). The report also includes macroeconomic indicators along with an outlook on prefilled syringes consumption globally. It includes drivers and restraints of the prefilled syringes market and their impact on each region during the forecast period. The report also comprises the study of current issues with distribution channels and opportunities for prefilled syringes manufacturers. It also includes pricing analysis by material and value chain analysis with a list of industry stakeholders at each node in the value chain. In order to provide users of this report with a comprehensive view of the market, we have included detailed competitiveness analysis and company players. The dashboard provides a comprehensive comparison of prefilled syringe manufacturers on parameters such as operating margin, unique selling propositions, collective market share, and geographic concentration. The study encompasses market attractiveness analysis, by material type, product type, application type, and region. The report includes consumption of prefilled syringes and the revenue generated from sales of prefilled syringes in all regions and important countries in these regions. By material, the global prefilled syringes market has been segmented into glass based and polymer based prefilled syringes. By application, the market is segmented into vaccines, monoclonal antibodies and others. On the basis of the distribution channel, the market is segmented into hospitals, ambulatory surgical centers and mail order pharmacies. Market numbers have been estimated based on average consumption and weighted average pricing of prefilled syringes by material and the revenue is derived from regional pricing trends. Market size and forecast for each segment has been provided in the context of global and regional markets. The prefilled syringes market has been analyzed based on expected demand. Prices considered for the calculation of revenue are regional average prices obtained through primary quotes from numerous regional prefilled syringes manufacturers, suppliers, and distributors. All key distribution channels have been considered and potential applications have been estimated on the basis of secondary sources and feedback from primary respondents. Regional demand patterns have been taken into account while assessing the market for various end users of prefilled syringes in different regions. Bottom-up approach has been used to estimate the prefilled syringes market by regions. Market numbers for global material, application and distribution channel segments have been derived using the bottom-up approach, which is cumulative of each region’s demand. The company-level market share has been derived on the basis of revenues reported by key manufacturers. The market has been forecast based on constant currency rates. Several primary and secondary sources were consulted during the course of the study. Secondary sources include FACTIVA, NCBI, Google Books, company websites, journals, press releases, Hoover’s, and company annual reports and publications. The report provides detailed competitive and company profiles of key participants operating in the global market. Major players in the global prefilled syringes market are Becton Dickinson & Co., Gerresheimer, Medtronic, Baxter International, SCHOTT AG, West Pharmaceuticals, Vetter International, Unilife Corporation, Stevanato Group, and Terumo Corporation.